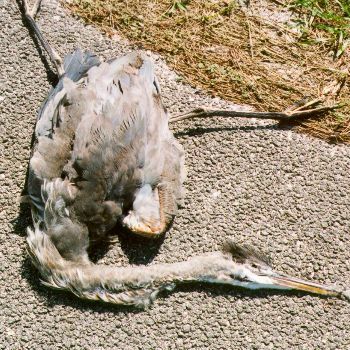 This Great Blue Heron is a rare road kill. We can only imagine that it was seen before it was hit. A surprisingly large number of people adopt the attitude that it will fly away before they get too close. Unfortunately, the bird is often times senselessly killed this way. This one was killed on Pine Island Rd. in front of the fruit stand by Burnt Store Rd.